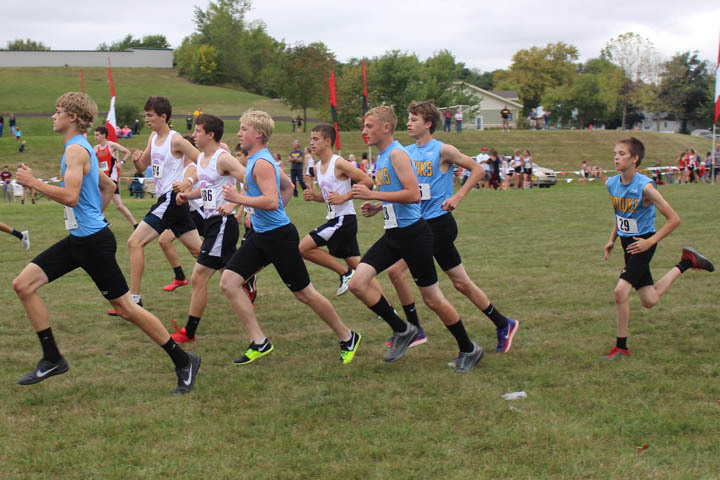 The Lynnville-Sully cross-country team finally got a break from the heat on Tuesday, Sept. 26. The Hawks traveled to Williamsburg, a fairly flat course, which is where the Hawks raced their very first race of the year. A combination of the course and temperature conditions led to fast times and exhibited just how far the team has come. The girls team finished fourth out of four, behind 3A schools Solon (first) and Williamsburg (second) and 2A Tipton (third). “The challenge presented tonight was just how much improvement could be made, to test themselves to see how much better they’ve gotten,” said L-S Head Coach Darin Arkema. 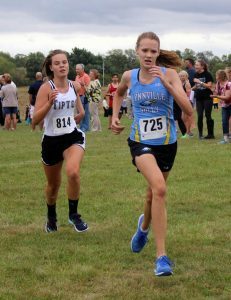 Abigail Davis battles with a Tipton runner as she places 31st as the fifth L-S runner at Williamsburg. Senior Mary Kate Shaver placed sixth, running the race in 21:06, and freshman Megan Van Zante finished in 22:32, placing 17th. L-S’s third runner, sophomore Abby Gruver, placed 27th in 23:32. Senior Christine Nikkel finished 30th in 24:05, and one place behind her was sophomore Abigail Davis in 24:09. Junior Emily Van Gorp crossed the finish line in 24:28, earning her 36th, and in 37th was senior Haley Breeden with a time of 24:39. Some other runners for the Hawks were senior Hailey Scandridge (25:40, 44th), sophomore Brittney Hansen (26:26, 49th) and freshman Hadley Tice (27:41, 58th). These times were season bests for Shaver, Van Zante, Van Gorp, Scandridge, Breeden, and Davis, proving to be a successful meet. Senior Josh Dunsbergen finished in 20th in 18:58, and junior Joseph Anderson placed 52nd in 20:33. One place behind Anderson was freshman Mason Jansen in 20:36. Sophomore Blaize Kuhl-mann crossed the finish line at 64th in 21:42, and freshman Luke Kramer came in at 24:41, placing 83rd. “I think there is potential for this group to maybe surprise themselves and a few of the conference teams in a couple weeks at that conference meet,” said Arkema. The junior high runners faced a lot of new contestants, running their race on a 1.5-mile loop. On the girls’ side, Greenlee Smock squeezed into the top 10, placing 10th in 10:18. She was followed by Kinsley Tice (11:43, 38th) and Reagan McFarland (12:26, 43rd). James Gruver was the first to finish for the JH boys in 9:21, earning 17th. Gruver was followed by Gentry Walston (9:37, 26th), Josh Hardenbrook (10:33, 44th), Ryan Annee (11:21, 61st), Zach Morningstar (12:33, 73rd), and Evan Fikse (13:14, 75th). Temperatures rose back to the 80s for the Hawks’ final meet before conference on Monday, Oct. 2. The Hawks ventured to North Polk, facing some new competition along with conference opponent Colfax-Mingo. The girls placed third out of seven teams, defeating Collins-Maxwell and Colfax-Mingo. For the sixth meet in a row, Shaver finished in the top six, placing fourth in 21:33. Following Shaver was Gruver in 24:06, earning 19th, and Van Zante in 24:08, earning 21st. Nikkel came in at 29th in 24:48 and Van Gorp at 34th in 25:06. Davis crossed the finish line in 25:56, placing 42nd, followed by Breeden in a time of 26:03, earning 46th. Other runners for the Hawks were Hansen (26:37, 50th), Scandridge (27:52, 61st), and Tice (31:02, 79th). The boys finished 10th at Williamsburg, 43 points behind Colfax-Mingo. Jansen and Dunsbergen had a competitive finish, Jansen running a 21:27, placing 67th. Exactly one second and one placing behind Jansen was Dunsbergen. Anderson crossed the finish line at 21:47 and placed 76th. He was followed by Kuhlmann, who placed 85th in 22:14. Kramer pushed to the finish to earn 136th with a time of 27:29. JH had another strong race, running a two-mile course. J. Gruver broke the top 10, earning seventh with a time of 14:59. He was followed by Walston (16:52, 17th), Hardenbrook (17:28, 22nd), Morningstar (18:47, 29th), Annee (19:05, 33rd), and Fikse (22:41, 48th). Smock also found a spot in the top 10, placing sixth and crossing the finish line in 16:33. She was followed by teammates Tice (17:45, 13th) and McFarland (19:09, 22nd). L-S’s next race is the conference meet in Colfax-Mingo on Thursday, Oct. 12. The Hawks have raced there before but hope to improve their times and show the conference what L-S is made of.